ISAIAH 54:17 KJV "No weapon that is formed against thee shall prosper; and every tongue [that] shall rise against thee..."
14In righteousness shalt thou be established: thou shalt be far from oppression; for thou shalt not fear: and from terror; for it shall not come near thee. 15Behold, they shall surely gather together, but not by me: whosoever shall gather together against thee shall fall for thy sake. 16Behold, I have created the smith that bloweth the coals in the fire, and that bringeth forth an instrument for his work; and I have created the waster to destroy. 17No weapon that is formed against thee shall prosper; and every tongue that shall rise against thee in judgment thou shalt condemn. This is the heritage of the servants of the LORD, and their righteousness is of me, saith the LORD. � No weapon that is formed against thee, shall prosper, and euery tongue that shall rise against thee in iudgement, thou shalt condemne. This is the heritage of the seruants of the Lord, and their righteousnesse is of me, saith the Lord. 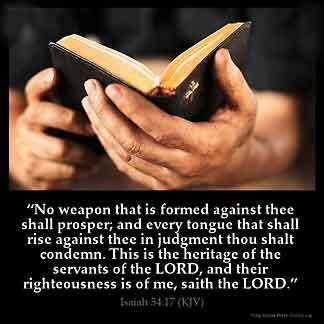 "No weapon that is formed against you will prosper; And every tongue that accuses you in judgment you will condemn. This is the heritage of the servants of the LORD, And their vindication is from Me, declares the LORD." No instrument of war which is formed against you will be of any use; and every tongue which says evil against you will be judged false. This is the heritage of the servants of the Lord, and their righteousness comes from me, says the Lord. No weapon that is formed against thee shall prosper; and every tongue that shall rise against thee in judgment thou shalt condemn. This is the heritage of the servants of the LORD, and their righteousness is from me, saith the LORD. No weapon that is formed against you will prevail; and you will condemn every tongue that rises against you in judgment. This is the heritage of the servants of Yahweh, and their righteousness which is of me," says Yahweh. No weapon formed against thee prospereth, And every tongue rising against thee, In judgment thou condemnest. This [is] the inheritance of the servants of Jehovah, And their righteousness from me, an affirmation of Jehovah! No weapon that is formed against thee shall prosper; and every tongue that shall rise against thee in judgment thou shalt condemn. This is the heritage of the servants of the LORD, and their due reward from Me, saith the LORD. 54:17 Condemn - And I will deliver thee not only from the fury of war, but also from the strife of tongues. This - This blessed condition, is the portion allotted them by me. Righteousness - The reward of their righteousness. Of me - I give it, and I will continue it to them. I love it. It is bringing me thru the fire and it touches me not. I love u my precious Jesus of Nazerith. righteousness in the Lord all mighty will win every time if you trust in the lord and just listen, he will take care of his children. Trust your heart to the lord and watch what happens. i 'm a pastor, we fill down some time to, but knowing god 's word is in his children and they know them , I want to say thank you. every evil influence.set against me shall by no means overcome the BLOOD OF JESUS-a helmet of protection on me.